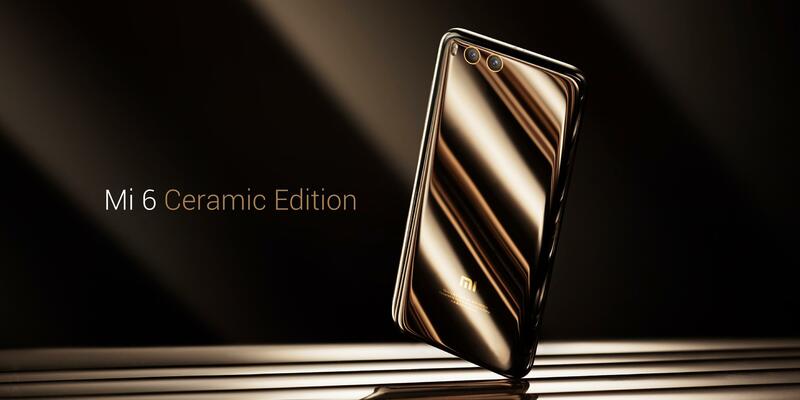 The Xiaomi Mi 6 continues the companies design trends from last years flagship, the Mi 5 featuring a glass back on a Stainless Steel chassis. This is in a bid to improve structural integrity vis-á-vis the more pliable, lighter Aluminium frame of the older flagship. Xiaomi claims that each chassis takes 12 days to produce and goes through 40 machining processes before being declared finished. The front receives the same all glass treatment, with the 5.15-inch full-HD (1080 x1920) IPS display panel and fingerprint scanner which doubles as a home button capable of gestures input under the protective glass. 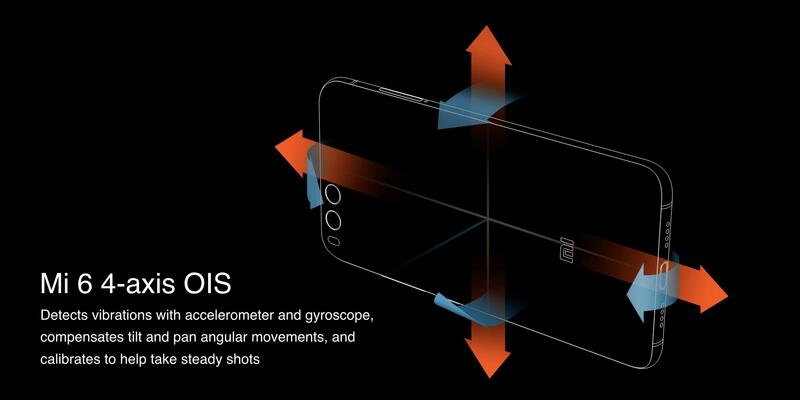 Although the display panel itself is flat the glass is of a curved 2.5D nature to make the device easy to hold and manipulate without digging into one’s palm while exuding a premium feel to the device. The front is dominated by the display but unlike the recent flagships does not eliminate the chin and forehead bezels completely. 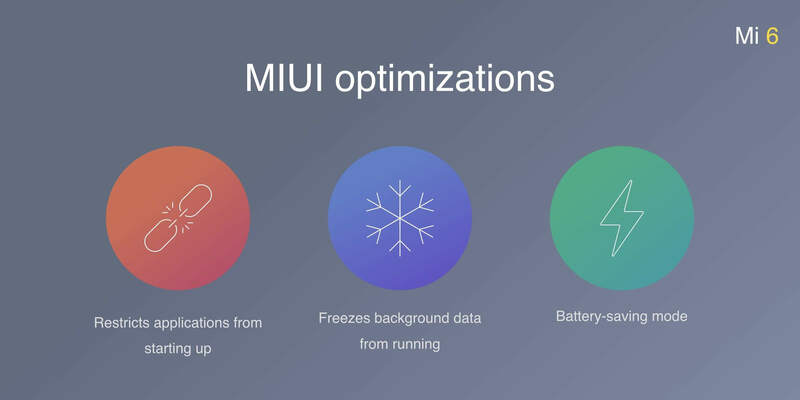 What the Mi 6 does eliminate is the 3.5mm audio jack, so you are dependent on the USB Type-C (v.1.0) connector for hardware-connectivity and recharging which is at the bottom of the device. 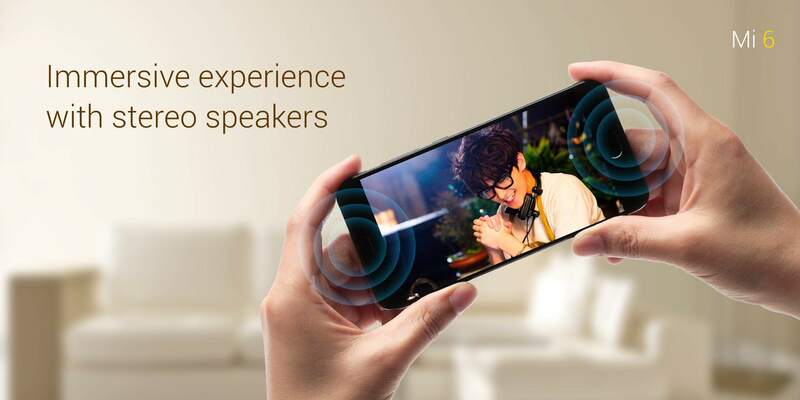 Xiaomi has provided the Xiaomi Mi 6 with a stereo-speaker set-up which is something of a rarity these days in smartphones but a welcome feature nonetheless. On the right side of the device lies the power button and volume rocker. On the hardware front, the Xiaomi Mi 6 is powered by Qualcomm’s Snapdragon 835 clocked @2.45GHz with an Adreno 540 GB. Coupled with 6 GB of RAM and 64 GB or 128 GB of internal storage. The display uses a Negative LCD display which maintains 600-nits of maximum brightness and 1-nit super low ultra-dark brightness for reading in low-light environments without straining one’s eyes. 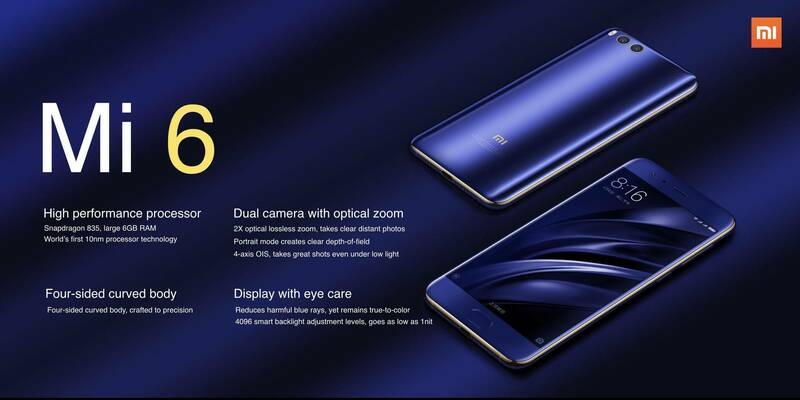 Xiaomi has provided for a dual-camera set-up on the Mi 6, the first for any device from the company. The module has one 12-megapixel wide-angle lens and the other is a 12-megapixel telephoto lens much like the arrangement on Apple’s iPhone 7 series of smartphones. The camera module is flanked by a dual-LED flash on its left and surprisingly Xioami manages to do all this without an ugly camera bump. 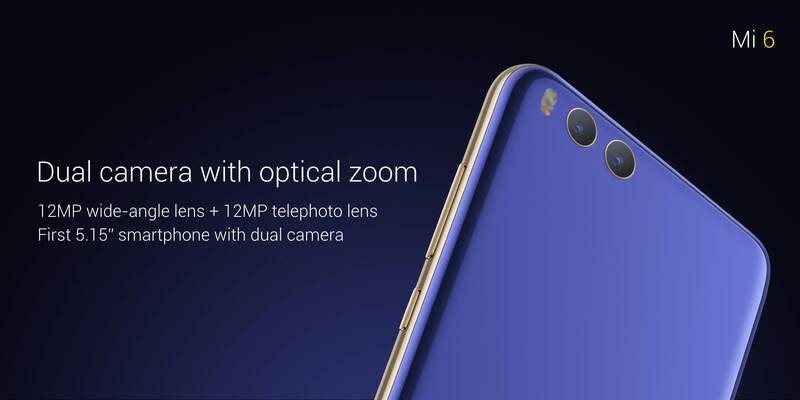 The camera is capable of 2x optical zoom, 10x digital zoom and features the same 4-axis optical-stabilisation as was present on the Mi 5. Powering all this hardware is a 3350mAh non-removable Li-Poly battery which the company claims is good for up-to a day under regular usage. For connectivity the smartphone is supportive of 4G LTE bands in China, WiFi up-to the ac standard (2.4GHz and 5.0GHz), Bluetooth v.5.0, NFC and an IR blaster up top. Xiaomi also claims that the Mi 6 is capable of taking the occasional splash of water but is not carrying an IP certification. 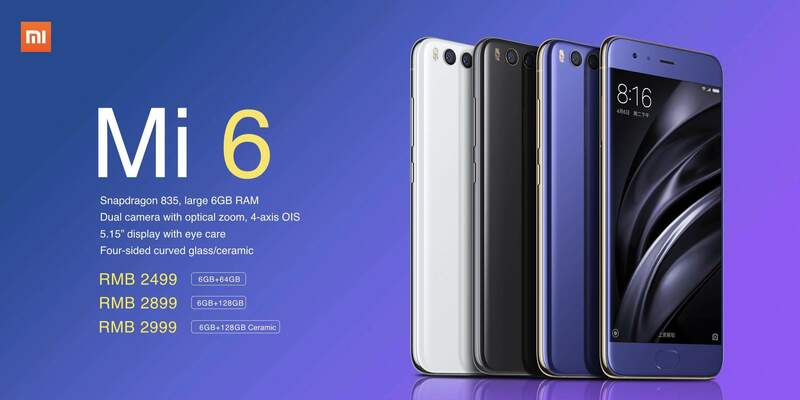 The Xiaomi Mi 6 measures 145.2 x70.5 x7.5mm while weighing in at 168 g. There is a special ceramic edition which is slightly heavier at 182 g.
Xiaomi is shipping the device with the latest version of MIUI which is based on Android, v.7.1.1, Nougat with enhancements which the company claims allow a user to increase the stand-by time by throttling certain apps and blocking background app-data sync. The Mi 6 is available in Black, Ceramic-Black, Silver and a brand new Blue hues. The Black, Blue and Silver variants start at ¥2,499 (~$360) for the 6 GB RAM, 64 GB internal storage variant while the 128 GB variant comes in at ¥2,899 (~$420). The Black-ceramic finish variant comes in only the 6 GB + 128 GB combo carrying a price tag of ¥2,999 (~$435). The device will go on sale in China from the 28th of April at 1000 Hours.